Red or blue presidents — Who wins when it comes to the stock market? Uncle Sam wants you (pot growers)! “U.S. homebuilder sentiment recorded its steepest one-month drop in over 4 1/2 years in November,” reports Reuters. 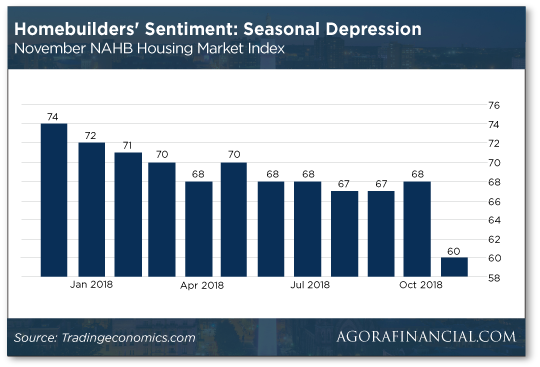 According to the National Association of Home Builders, rising home prices and mortgage interest rates are sidelining homebuyers, causing homebuilders’ sentiment to slide eight points from October to November. Perhaps the most stand-out NAHB number relates to buyer traffic; that dropped to 45 from 53 in October. Any number under 50 means more builders view conditions as poor rather than good. “There is a definite shift,” says Lawrence Yun, chief economist of the National Association of Realtors at Forbes. In September, in fact, 465,000 new listings came on the market in 45 of the nation’s largest metro areas — “an 8% increase that marked the largest annual inventory growth spurt since 2013,” Forbes says. Meaning that most basic economic principle — supply and demand — cuts both ways; oversupply might be a rude awakening for sellers accustomed to bidding wars and double-digit gains. “You buy a house for $100,000,” he says. “You fix it up and sell it for $140,000. Your $40,000 profit when you sell the house is capital gains. Look no further than a decade ago, in December 2008, when home values across the country plunged a record 18% during the height of the mortgage crisis — after 11 years of escalating real estate prices. Who’d a thunk? Certainly not the Fed… heh. On the other hand: “Cash flow is an ongoing stream of income you receive from an investment,” Robert says. You buy a house and rent it out… That monthly rent is cash flow. Here’s the best of both worlds: “Essentially, you own an asset, you keep it and you collect money off it at the same time,” Robert says. And that’s one of the life-changing secrets of Robert’s Rich Dad formula: Even if you don’t have millions of dollars set aside in savings, “you simply need to build up your monthly cash flow to be greater than your living expenses. [Ed. note: If you’ve been following The 5, you know Robert Kiyosaki’s two favorite words… Cash. Flow. One more advantage of focusing on cash flow is that it eliminates the fear of running out of money… a fear that’s all too real for many retirees. Even if you haven’t saved millions of dollars for retirement, Robert’s hosting a Retirement Masterclass showing how accumulating assets that provide predictable cash flow might be the way to financial security. To the markets, where we’re seeing so much red…The Dow’s dropped below 25,000; it’s shed about 370 points today, to 24,950 at the time of writing. As for the S&P 500, it’s down to 2,662, dropping about 30 points. The Nasdaq’s also down 56 points, to 6,972.83. On to commodities: A barrel of West Texas crude’s going for $54.41, down $2.79. Gold’s selling for $1,223.90; that’s $1.40 off its price. Alas, bitcoin continues its slide to $4,641.98, down $152.48. According to the Commerce Department: “Housing starts ticked up 1.5% to a seasonally adjusted annual rate of 1.228 million in October,” MarketWatch says. But that’s 2.9% lower than last year. 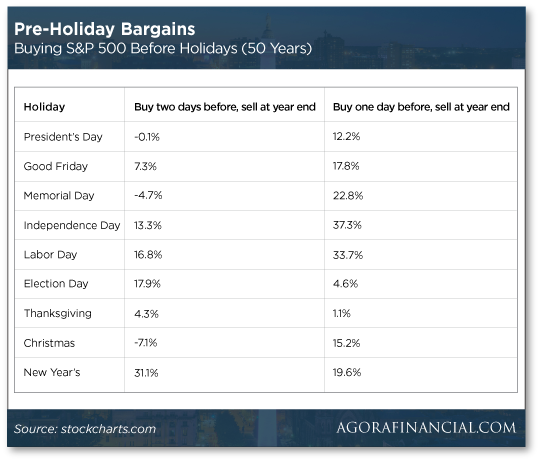 “Due to the Thanksgiving holiday,” says Agora’s income specialist Zach Scheidt, “the stock market trading week is shorter than usual.” After today, blessedly shorter. You’re probably aware markets are actually closed on Thanksgiving Day… unlike so many other retailers. And the market’s operating on a half-day schedule Friday, closing shop at 1 p.m.
“But here’s how you can use the short week to book a big gain,” Zach says. A nice little bump, we’d say. “Many investors are selling into Thanksgiving because they are worried of possible bad news,” says Zach. “But much of the bad news has already been priced into stocks. “The beauty of this trading strategy is that it’s not just limited to Thanksgiving. You can use it for just about any holiday. Might want to mark your calendars…. During Obama’s first year in office, the S&P 500 expanded 23.45%. The year after re-election? Even better at 29.6%. Makes Trump’s first-year S&P 500 returns seem a little wan — 19.19%. Obama sort of broke the mold there — in 2011, market performance was flat while 2015 was slightly negative with a 0.73% loss. Nilus emphasizes he’s not getting all political here — just looking at the data. “This just in,” says our potstock authority Ray Blanco: “The federal government is in search of experienced pot growers for a lucrative business opportunity. “Uncle Sam is looking for companies capable of producing up to 2,000 kilograms of marijuana — and keeping as much as 5,000 kilograms of ‘marijuana stock’ on site,” Ray says. And that’s not all: The job posting says the government’s looking for growers with extensive accounts payable know-how… and a talent for rolling “marijuana cigarettes”? Bonus! Although if Sessions were still — well, in session — we wouldn’t put it past him… heh. The job posting represents hope to marijuana advocates in the U.S. that the tide’s really turning in favor of federally legalized cannabis. “We’re talking potential blockbuster drug revenues,” he continues. “So it’s reassuring to see the feds moving in the right direction when it comes to pot policy. More MoviePass Bedlam: “Our cash and cash equivalents may not be sufficient to fund our operations for the near future and we may not be able to obtain additional financing.” So said MoviePass’ parent company Helios & Matheson (HMNY) in the company’s 10-Q filing. 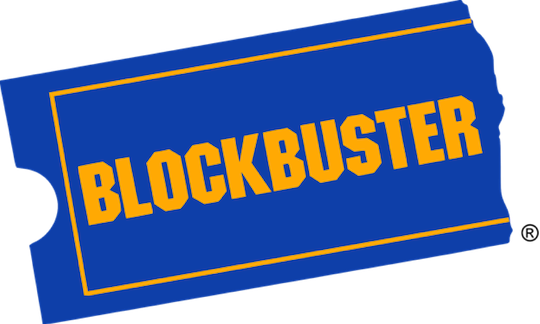 Hmm… If any “source” is willing to pony up some capital for MoviePass, we’ve got some Blockbuster shares to unload… heh. Is MoviePass the next Blockbuster? So Q3 earnings gotta be fantastic, right? Not so much: Losses in the third quarter amounted to $137.2 million. Because the movie-theater subscription service has changed the rules on customers so laughably often, the company said it experienced a “significant decline” in subscribers during the third quarter. To add insult to injury (hemorrhaging, in this case), two board members — Chris Kelly and Maria Stipp — decided they’re not going down with this particular Titanic. Kelly: Umm, guys? I’m just gonna step out for a few… stretch my legs. Stipp: (rushing towards the door) I’ll join you, er, for a smoke… Yeah, that’s the ticket. At any rate — if you’re a subscriber — before MoviePass officially goes kaput, you might wanna squeeze in that 77% of a movie. P.S. Robert Kiyosaki’s book Rich Dad Poor Dad is the No. 1-selling personal finance book… OF. ALL. TIME. with little-known tricks of the rich that weren’t included in the book. Click here now to see how you can learn some of the ways Robert retired at age 47 with massive wealth.